As energetic and hardworking as they come, Ashton Hey has been trained by one of South Africa’s best all round performers, Hutaro. Being trained in the skilled arts of the warriors above, Ashton looks straight into the eyes of hell as he soars the blue sky with freedom. He does not fear a single soul and will not back down from any opposition. His goal is simple and that’s to wipe out his foes with his speed and velocity. When lightning strikes, this noble hero can be found. He is one for the future indeed and shows promise as he quickly adapts to many different styles. 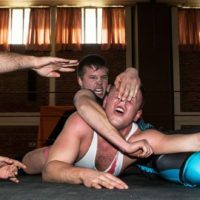 Ashton is one of the elite new generation professional wrestlers, who inhabits the sense of evolution in the South African wrestling scene. He has come to the APWA to prove he is the best. With eyes set on championship heights, where will Ashton’s lightning strike next?